It almost seems unfair reviewing this film as it appears that the only surviving version, which runs a short forty-nine minutes, has been severely truncated from a sixty (possibly even ninety) minute run time. With a portion of the film missing, it’s hard to be truly objective and at times make sense of the events as they happen. Take the opening for example: as the film begins, Violet Stoner, who has been in her bedroom, screams, opens the door and then collapses dead in the hallway, as people rush to her side to see what the commotion is about. Later, there is a flashback where we see Violet, with her last words, warn her sister about a ‘Band, Speckled’. This dialogue is omitted from the opening sequence. Anyway, I’ll make do with the best I have. The film concerns two sisters, Violet and Helen Stoner (Angela Baddeley) who live with their brutish step-father, Dr. Grimesby Roylott (Lyn Harding). When the girls are married off, they are each to receive a substantial annual allowance — which of course, will put a huge dent in the financial affairs of Dr. Roylott. 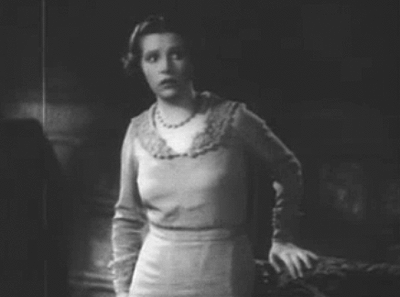 As the film opens (as I have described above), Violet is engaged and set to be married. Then one evening, she collapses in the hallway dead. The incident is suspicious, but foul play cannot be proven. Dr. John Watson (Athole Stewart) is a family friend and at the inquest into Violet’s death is unable to ascertain the cause of death. 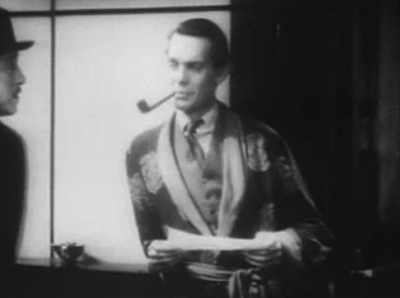 Later he relates the details to the case to Sherlock Holmes (Raymond Massey), who locks the information away in that methodical mind of his. Initially, (and this may be to do with the cuts to the film) this incarnation of Holmes and Watson seem quite different to other versions. Firstly Holmes seems to live alone at Baker Street — it is implied later that Watson is simply staying over one night. Incidentally, the address appears to be 107 Baker Street – not 221B as Holmes fans are used to. Next, beside Holmes’ living quarters is an office, and in his employee are two secretaries that are cataloging and typing out all the information on London’s criminal underworld that they can gather. This information is stored in a row of filing cabinets against the rear wall. It is a very different and organized approach to the manner in which Holmes is usually portrayed. And besides it is rather strange seeing Watson scurry past a typing pool to visit his good friend Sherlock Holmes. This high-tech (for 1931, that is) is taken even further, when Holmes and Watson are discussing the mysterious events in Holmes’ living quarters out the back. As they talk, Holmes points out a small intercom system. Their conversation is being listened to and typed out by one of the secretaries in the outer office. If Holmes should require this information anytime in the future, we will have a perfect record — word for word, as it happened. One year later, Helen Stoner is sitting in the garden with her fiancé, Curtis (Ivan Brandt). Curtis has bad news for her. It appears that he is to be shipped off by his family to Rangoon for six months to a year to manage a plantation. Helen is dismayed to here the news because it means she will be under the oppressive yoke of her step-father for another year. Curtis can see that his betrothed is frightened, and when she suggests that she comes with him, he suggests that they bring the marriage forward. When Roylott hears that Helen is preparing to marry in the next few days, he isn’t pleased. Once again his financial standing is threatened; and he only has a short time to do something about it. Over the next few days, Helen notices the same series of events unfolding that happened just before Violet’s death. Firstly a band of gypsies return to the area. Next, at night, strange music is heard drifting through the mansion. The last straw is when, Roylott demands that Helen sleep in Violet’s room — due to some repairs that Roylott has instigated in her bedroom. 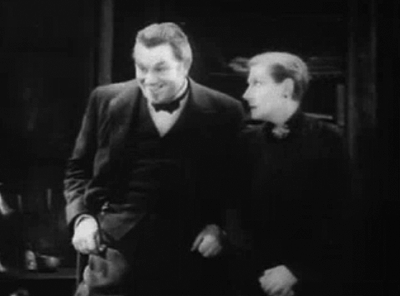 Fearful for her life, Helen approaches Sherlock Holmes and Dr. Watson for help. 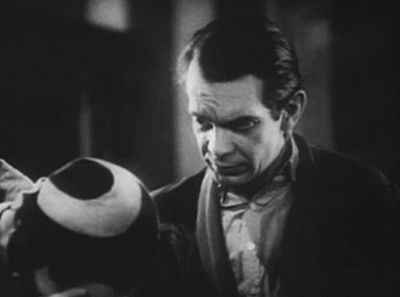 Raymond Massey, in his film debut, is a cold and sinister looking Sherlock Holmes. But the most frustrating thing (and this once again may be to do with the editing) is the detached workman-like relationship between Holmes and Watson; which doesn’t thaw until the closing scenes in the movie. There is no sign of friendship between the two men, and at times, Holmes almost seems antagonist towards Watson. I must point out, that Watson is not portrayed as a bumbling fool in this film, so the antagonism is not directed at any clumsiness, incompetence or lack of intellect. The actual mystery part of the film is well handled, but of, course will come as no surprise to those familiar with Conan Doyle. As the villain of the piece is revealed quite early, the mystery is not ‘whodunnit’ but ‘how-he-does-it’ — and that comes down to the central mystery — what is the ‘speckled band’? 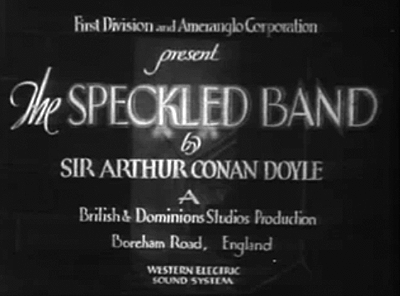 It’s strange watching such an early Sherlock Holmes film; although there were quite a few Holmes films before this one, and as far as I can ascertain, this is the second filmed version of The Speckled Band, the first being a silent film made in 1923, starring, Eille Norwood as Holmes. Sherlock Holmes, over the years, in many films, books, comics, radio plays and television shows has become distilled down to a very identifiable character. Many of the traits we associate with Holmes are not necessarily those created by Arthur Conan Doyle, but none-the-less, now we expect to see Holmes portrayed with these accessories; whether it be the deerstalker cloak and cap, smoking a pipe; or even saying ‘Elementary, Dr. Watson’. Now watching a film, that pre-dates the accepted Holmesian tropes, or even one that deliberately dispenses with such artifacts (such as Guy Ritchie’s recent film), can for some people, be a disorientating experience. I for one don’t think it is an issue. For a character to survive, he must be relevant to the times in which the stories are being told. If you look at the character of Robin Hood, over the hundreds of years his story has been told, it has changed wildly with Hood being portrayed as a rebel outlaw, a trickster, a romantic hero and countless other guises. The stories would change to suit the needs of the populace of the time — and that’s how the character Robin Hood has survived for so many years. Holmes too, will change to suit each new generation, and as annoying as it can be to the purists, I believe it is the way it should be. The beauty of living in the age we do, we can now preserve these stories forever. 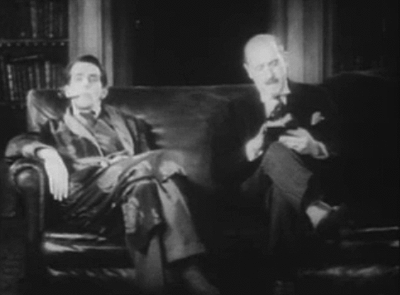 Rathbone, Jeremy Brett and even Matt Frewer’s versions of Holmes, in the digital age, will live forever. The negative side of that ledger is that It is a pity that already so much Holmes history has been lost. This film, The Speckled Band, is really just a shadow of its former self. Equally, many of the BBC episodes with Peter Cushing have been lost forever too. But Holmes will go on. He may not be the character that you and I grew up with, but none-the-less he will be solving crime on the foggy streets of London. For those who want to head back to the source, you can read Conan Doyle’s full story, The Speckled Band on Gary Dobbs’ The Tainted Archive, which also contains a swag of other great reviews, stories and other Holmesiana.